Back in September of 2008, James Pearson made the first ascent of a traditionally protected slab climb in England he dubbed Walk Of Life. At the time, Pearson proposed a grade of E12 which would be similar to someone climbing a sport route and calling it 5.15c or 5.15d. Basically, he felt as though it was the hardest traditionally protected climb out there. Enter Dave MacLeod. It seems as though MacLeod was looking for some “therapy” for a nagging case of elbow tendinitis, which led him to try his hand at the slabby Walk Of Life. Somewhat surprising to MacLeod was that the climbing was not terribly difficult (for him) and also not terribly frightening (again, for him). After a few days sussing things out MacLeod did the 2nd ascent, and he is proposing that Walk Of Life is more in the neighborhood of E9. So it is hard and scary, but not that hard and scary. E12 7a is the point on the scale that I feel best reflects my experience, and what a crazy thing that is to say. Using two very inflexible numbers to try to sum up my thoughts and feelings at the final point of a 4 year journey seems ridiculous, and really takes something magical away from the route. There are so many things about The Walk Of Life that are special to me without even thinking about the grade, and any of these special parts explain the experience infinitely better than those 2 numbers ever could. My thought is that James graded it (Walk of Life) so high since when he first tried to lead it he took a wicked long whipper, 60 – 80 feet or so. Possibly proof to him that it was desperate. I think a similar thing happened with MacLeod and Rhapsody. Dave took crazy whippers off the last move and repeatedly hurt himself. Sonnie figured out a safer way to take the same fall and thus it was less scary. With The Promise James did not believe the ball nut would hold and choose not to use crash pads. All subsequent attempts believed and tested the ball nut (it did not fail) and used pads. The whole “Experience” part of E-Grades seems to have this flaw in regard to the danger aspect of the climb. I’m all for a two part grade but they should be independent, American style. Valid point. I think that a lot of times the experience one has doing an FA can bias them into thinking it was harder with subsequent repeaters always finding things easier once they know things are possible. 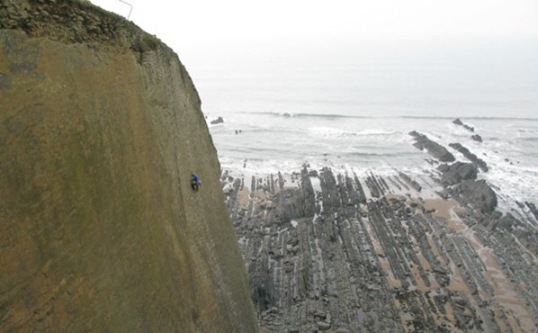 I would imagine this is only magnified with bold lead climbing. Tough thing being an FA. It’s always easier to repeat something when you either see or know someone else has done it, esp if you have a little beta. Bjorn Pohl’s comments are right on the edge of nasty, in my view. He is insinuating things about Pearson’s motivations and abilities that are inappropriate. More on my blog. but more strange is the fact that james felt the route was above and beyond ANYTHING else that had been climbed before and yet dave feels it is well below. that’s grading for you, but i wonder if james’ impression of his FAs will start to come under check now that his two hardest have been severly downgraded. Old gritter: Grading has always been always been subjective and this is the first (and certainly not the last) to be wildly over-graded. What is important here is the FA – the effort and commitment involved, not the ‘I made it easier’ SAs. Knowing that the route has been done in the first place gives a massive psychological advantage to followers. In my humble pie opinion, if pressing routes gives you a buzz, stay on bolts and clips.